Q: I have downloaded Qoppa’s jPDFEditor Sample, the sample / demo application for Qoppa’s Java PDF component jPDFEditor. Is there a log file and if so where can I find it? A: Qoppa keeps a log file for each of our sample applications, and all exceptions as well as additional information are being logged to this file. 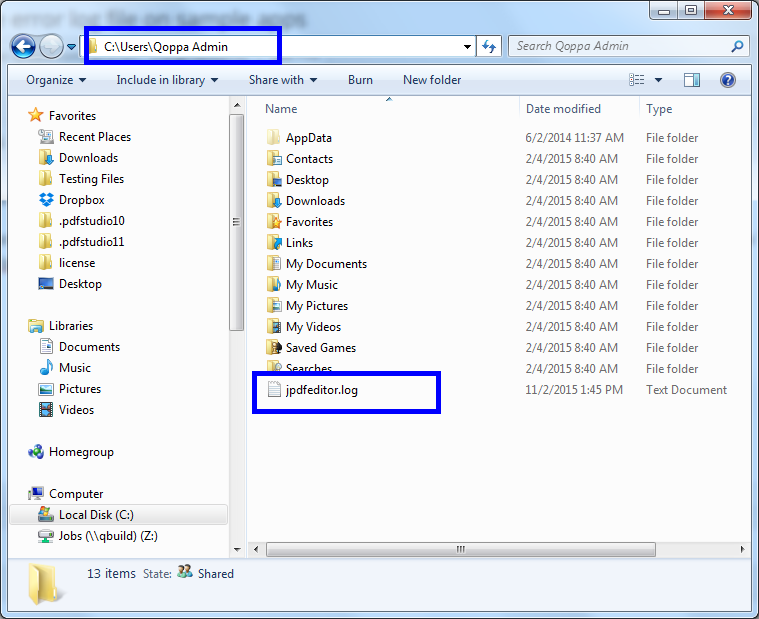 You can find the log file by going to your user home folder. The log file is named using the application name and a “.log” extension (for example: jpdfeditor.log, jpdfnotes.log…). For instance on a Windows machine with a user name of “Qoppa Admin”, the log file will be located under the user home folder “C:\Users\Qoppa Admin”. All our sample applications have been set to run with Qoppa’s debug flag on (-qoppa.debug=true) and to redirect the console to the log file. Read more about how to turn Qoppa’s debug flag on.